Learn your fractions by playing this fun egg-tastic game with your friends or family. Players will use eggs in an egg carton to create different fractions. You won't even remember this is an educational game and that you're learning since you'll be having so much fun. 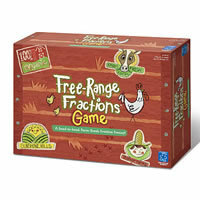 Free Range Fractions is great for kids ages 8 and older and is a fun way to practice your math. Learn more below on how to play and be sure to let us know how you liked playing this game if you've ever had the chance. Give Free Range Fractions a try today. Be the first team to earn 10 cards and you'll win. Inside is two egg cartons, 24 two-tone eggs, 54 denominator rings in 5 colors, 45 cards and the official Free Range Fractions game rules and instructions. Please keep in mind that the official Free Range Fractions childrens rules and instructions could be different depending on the game version you have. The rules below are some of the exact directions on how to play Free Range Fractions. Share with us your comments, funny stories, tips, advice, strategies, creative ways to play, questions about how to play, problems with the rules or anything you want about Free Range Fractions. All submissions will be reviewed within 24 hours. Click here to add your Free Range Fractions comments.